Source: adapted from "Mga Luto ni Tiya Lumen"
Line two 8-9 inch square or round pan with banana leaf, if using ( wipe and wilt the leaves over medium fire, cut into square or circle that will fit into whatever pan you're using). In a bowl, sift together flour, baking powder and salt; set aside. In the bowl of your mixer, combine egg yolks and brown sugar together and beat until light in color. Add half of the flour mixture, beat well then the coconut milk , then the remaining flour mixture. In another bowl, beat egg whites until soft peaks form. Fold whites into flour mixture/batter, careful not to knock the air out. Top with slices of salted egg and cheese. Divide batter into 2 and pour into prepared pans. Bake for about 10-15 minutes; take out from the oven, brush with melted butter and sprinkle granulated sugar on top then return cake to the oven and bake some more until the top is browned. 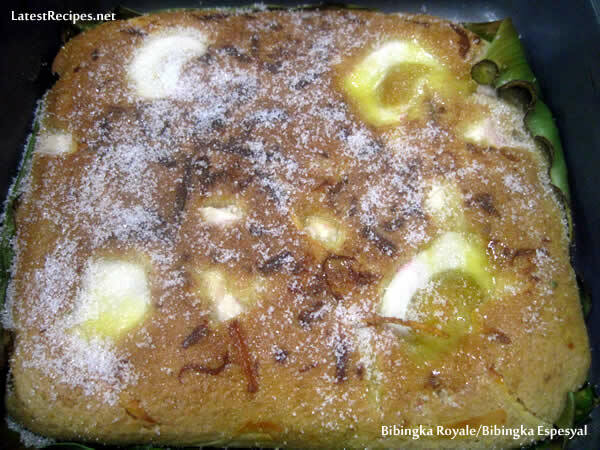 One Response to "Bibingka Espesyal (Bibingka Royale)"